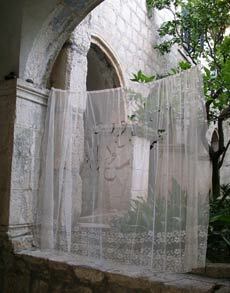 Zaostrog Monastery, Croatia, July 2004. "Free thyself from the fetters of this world, and loose thy soul from the prison of self." 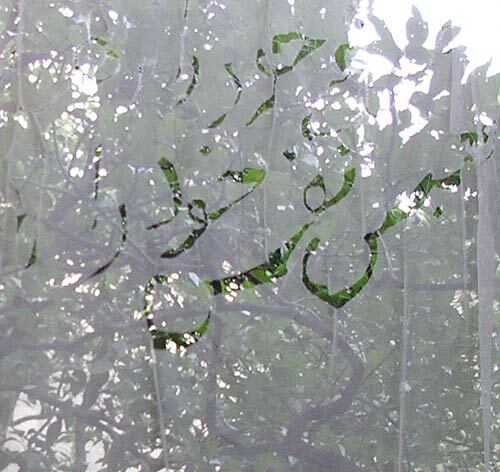 Persian was chosen because of the beauty of the flowing shekasteh script, and because it a medium for mysticism, especially in the hands of poets. 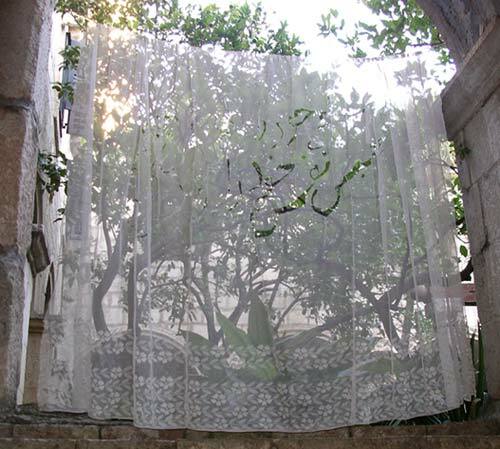 Curtains such as this are made to be seen through, while creating a private space. 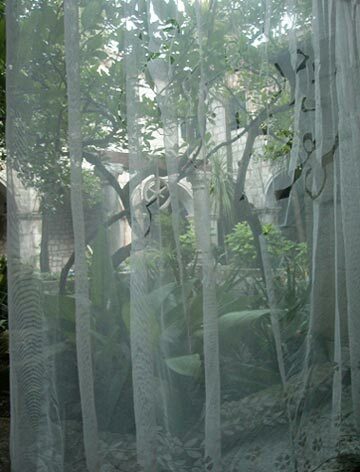 In this work however the viewer is required to focus on the barrier of the curtain's surface, to see the lettering there. The theme is an ancient truth: the limitations we impose on ourselves constrain us in a real way, yet we can break those bonds as easily as brushing aside a flimsy curtain. < Photo: Julie Fowler-Smith, Australia. Nga Hau e Wha (The Four Winds/Breaths), sculpture scheduled for Sept. 2004. 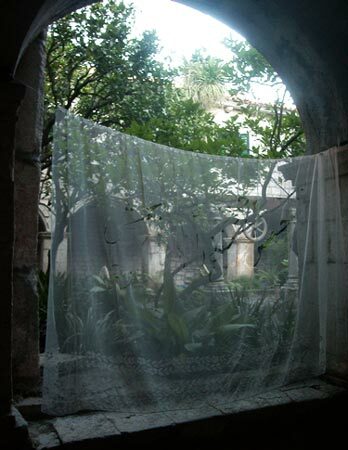 The Gossamer Prison, curtain and thread, 2004. 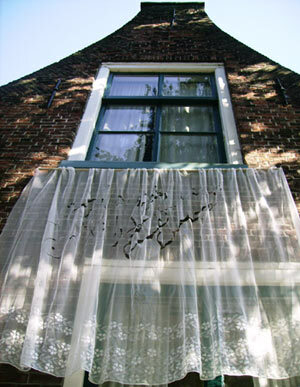 The Wedding, intervention/installation during the 9 Dragonheads festival, April 2004. Colonising Oxford, performances and installations on the streets over a period of two weeks, 2002. Fruits of the Earth, spiral cut out of a dried grass area inserted with plastic flowers, 2003. With fire we test the gold and with gold we test our servants, 2003, wooden sculpture made during a Sculpture Symposium in a park in a village in Northern Romania. Parking Spaces for Important Visitors, 2001, paintings on shaped canvas laid over a floor/ground. Inspiration, 2001, paintings on shaped canvas laid over a floor/ground. Just pour les oiseaux (Strictly for the birds), 2001, installations and performances during a walk through a forest setting led by a guide. 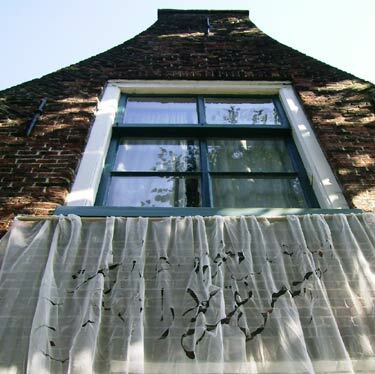 Onder vier ogen (Between you and me) , 2001, mask-forms hung on trees, with texts and images in the orifices. 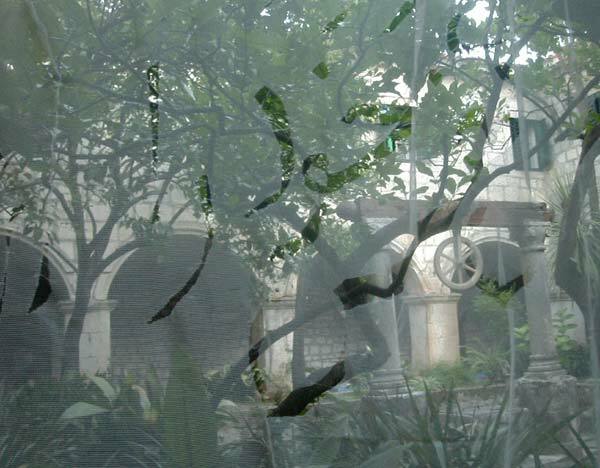 Dans le jardin des beaux arts, 19 snail forms, 2000 (in various locations). The Living Creature, 1999, performances by seven artists and one child in a rose garden in a public park in London. Memorials, 1996-2001, ceramic tiles laid into the earth. Te Koru Iwa, 1996, fire drawing at the Oerol Arts Festival, The Netherlands. Letters van de Levende, 1996, 19 batiked flags along the ridge of sand dunes during the Oerol Arts Festival.